Emily worked for the Australian Broadcasting Corporation (ABC) for 10 years as a specialist rural journalist, presenting the Rural Report in the NSW Riverina and reporting for the Country Hour. She was awarded the NSW Farmers McKellar Media Award for broadcast journalism in 2006, 2007 and 2008. 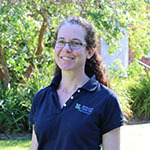 Emily began working as a media officer at Charles Sturt University (CSU) in 2011 and joined the Graham Centre in 2017. As communications and web officer Emily is responsible for promoting the Centre's research through traditional and social media, editing the Innovator and maintaining the website. You can follow us on Twitter @GrahamCentre and on our Facebook page.